Turn off running water when brushing your teeth, shaving, or cleaning produce. Change this simple habit and you can save more than 100 gallons a week! Replace older showerheads with high-efficiency showerheads which can save hundreds of gallons each month. Operate washers with full loads, even if machines have varied settings. Use a broom instead of a hose to clean your driveway or sidewalk. An easy way to save hundreds of gallons of water. 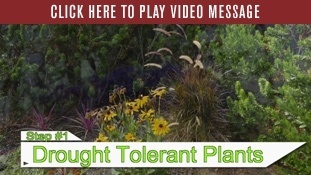 Replace your turf with drought-resistant and native plants. Water lawns and plants during the cool part of the day, between 6 pm and 10 am, to reduce evaporation. Install a drip irrigation system in your landscaping to reduce runoff and evaporation, and use mulch to reduce moisture evaporation from the soil. Detect and fix plumbing leaks inside and outside your home. Contact us for assistance in locating the leak detector on your water meter. Install aerators on bathroom and kitchen sinks. Saves 1.2 gallons per person per day. Replace your old toilet. New high-efficiency toilet models flush at 1.3 gallons or less compared to older models, which can use up to 7 gallons per flush. And consider dual-flush toilets that have two options: a half-flush for liquid waste and a full-flush for solid waste. Replace your clothes washer. High-efficiency clothes washers can reduce water and energy use by 40%. Install a water and energy-efficient dishwasher. Saves 3 to 8 gallons per load. If your dishwasher is new, cut back on rinsing. Newer models clean more thoroughly than older ones. Take your vehicle to a self-serve or full-service car wash that uses recycled water instead of washing at home. Not only do car washes save water through treatment and recycling, but it also prevents car wash pollution from entering storm drains and running off into the ocean. Make your showers 5 minutes or less. Each minute you cut saves 2.5-5 gallons. 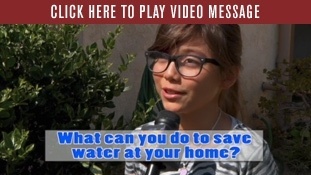 What Can You Do to Save Water at Home? What Can You Do to Reduce the Amount of Water in your Garden? Longer grass shades the soil, encourages deeper roots and saves water. Set your lawn mower for a higher trim setting. Check your landscaping often for leaks in pipes, hoses, faucets, sprinklers and couplings. Small leaks can add up to large water loss. Contact us for assistance in locating the leak detector on your water meter. Use drip irrigation systems for plants and gardens. Drip irrigation can be up to 90% more efficient than conventional irrigation systems. During the winter and wet weather, your landscape requires much less water than in the summer, so let Mother Nature do the watering! As the weather heats up, increase your weekly water schedule by adding a day or click here to view our proposed Smart Irrigation Schedule. The time of day you water is also an important factor. We recommend watering before 9 am or after 7 pm to minimize evaporation. Get rid of weeds, which compete with your ornamental plants for water. Don't use water on gutters, sidewalks, and driveways. Position sprinklers so water only covers lawn and plants. Use a broom to clean off paved areas. Use mulch around trees and plants. It will slow evaporation and discourage weed growth. Plant drought-tolerant and native plants that require little water along with a drip irrigation system. Utilize the popular Lawn-Be-Gone Rebate Program to replace turf with more water-efficient landscaping. Click here for more information and an application. For tips and tools on how to design your new water-efficient landscape, check out the Water Wise Gardening" program here. Water-efficient habits will result in a healthier lawn and garden, in addition to conserving water and saving money! Mid-Peninsula Water District (MPWD) urges all water customers to be proactive in searching out leaks both inside and outside of your household on a regular basis. Not only will it save water and money, but prevent larger problems and expenses that may develop in the future. Contact MPWD at info@midpeninsulawater.org or visit our office if you need assistance in locating the leak detector on your water meter, or, would like to obtain free dye leak detection tabs. Remember, even a small leak left undetected or unfixed can waste precious gallons of water. Be water smart during the drought. For the past two years, MPWD has been replacing its old water meters with new automated meters that alert staff to potential water leaks on a daily basis. This is a major help to customers in conserving water and saving money on their water bills. “A daily leak report is automatically emailed from MPWD’s website to its customer service personnel and actions are taken immediately to contact customers about a possible leak,” notes MPWD Engineering Tech, Brent Chester. He also adds that transmissions from the new meters will NOT affect garage door openers because they operate on a completely different frequency. Approximately 2,000 meters were in place at the end of 2013.